After a blustery snowy winter and then c0ld rainy days we finally are seeing signs of new life all around us. As soon as the rains stopped, the store rooms of water in the ground and trees provided plenty of moisture for the new life popping out everywhere. In just one week our empty trees and bushes have sprouted buds and blossoms. The landscape is as alive as a painter’s easel undergoing sweeping strokes from an artist’s passion-filled inspiration. And this is not life rejuvenated, brought back to life wearing the scars of winter. This is brand new life, pulsating with newness, color, and fragrance. The earth is being re-born. 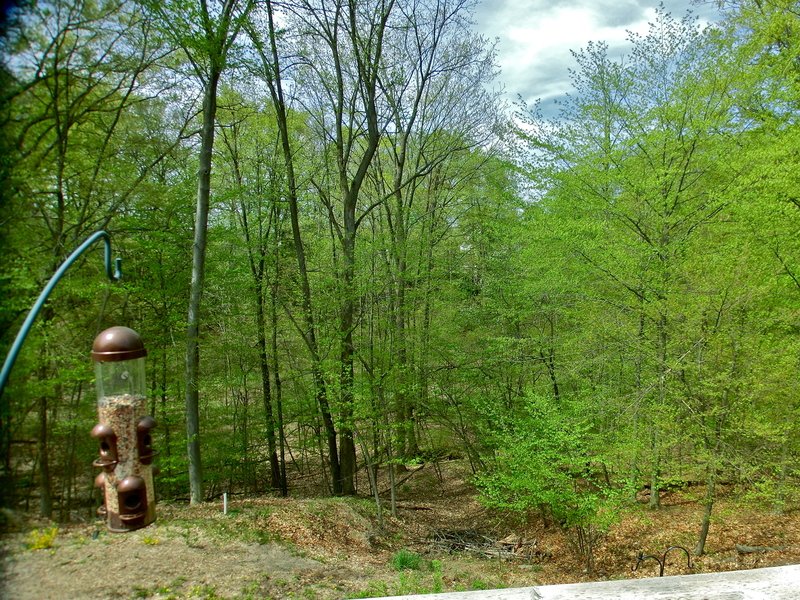 The photo is of the ravine behind our house. You may or may not be able to make out another house through all the greenery. It is a sign of Spring’s recreation which is all around us. What an amazing event! What was empty scraggly trees between us is now alive with magnificent greenery. For those of us who are getting older, all this new life might spark some hope. Decay and death are not the intended goal of creation. I remember thinking one time as I watched young men playing baseball. “If I cannot throw the ball as hard as they can, and run as fast as they do, I am glad someone can.” I live vicariously through their strength. Similarly I draw renewing strength from being outside in Spring Time. What a wonderful, concrete example of creative power. Is it just an analogy for us or is there more to it. From my spiritual background, I believe these signs of new life are pointers to the new life I shall someday experience in Christ. I wonder what that will feel like? This entry was posted in Creation, Eternal Life, Nature, Spring and tagged Christ, Creation, Renewal. Bookmark the permalink.